We each have a repeated and specific lie that the devil loves to spout. He whispers this truth so we whisper to our heart that we really can't make it in this thing called faith. Steal: To run away with our dreams, hopes and passion to immobilize us as unable orphan children. Kill: To ruin us through the power of sin's ability to drive us to death. Destroy: To destroy our faith, through doubt. To destroy our family through unchecked lies that lead to unchecked emotions. To destroy our intimacy with God through circumstances. But, God doesn't leave us like abandoned children, without strategy, security or certainty. He gives us a direct and clear action plan for how to approach the one who wants to approach us like a devouring lion. Because God's light makes darkness flee. His ways are the opposite of steal, kill and destroy: the way, the truth and the life. A deceiver can't deceive a person wrapped up in complete truth. The murderer can't stand to be around the one who offers new life. Fakes are obvious when God's Word magnifies their flaws. The opposer knows who will one day truly oppose him - and win. 1. Be truthful, vulnerable and open. Those who are real before God allow a real God, not a fake duper, to run to their rescue. Liars want to get up and flee with truth takes the stand. Let your truth take stand before God and he will take stand for you. When the power of people link hands, the devil can't as easily push through. A reinforced fort girded up with the powerful bricks of encouragement, truth and prayer isn't easily toppled. What has been fortified, usually remains purified. When you sword up with the power of the Spirit, you have the ability to slay approaching evil at its onslaught. God's Word cuts lies faster than a surgeon can cut malignant cancer. 4. Draw a line in the sand. Do you believe that your Savior King is for you or against you? Do you believe he is working for your good or for your demise? When we take a stand, the confuser often cannot. The blood of the lamb covers us today in the same way it did yesterday. It saves us from slaughter. It protects us from eternal defeat. That, coupled with our testimony, is an unbeatable force that forces the powers of hell where they belong. 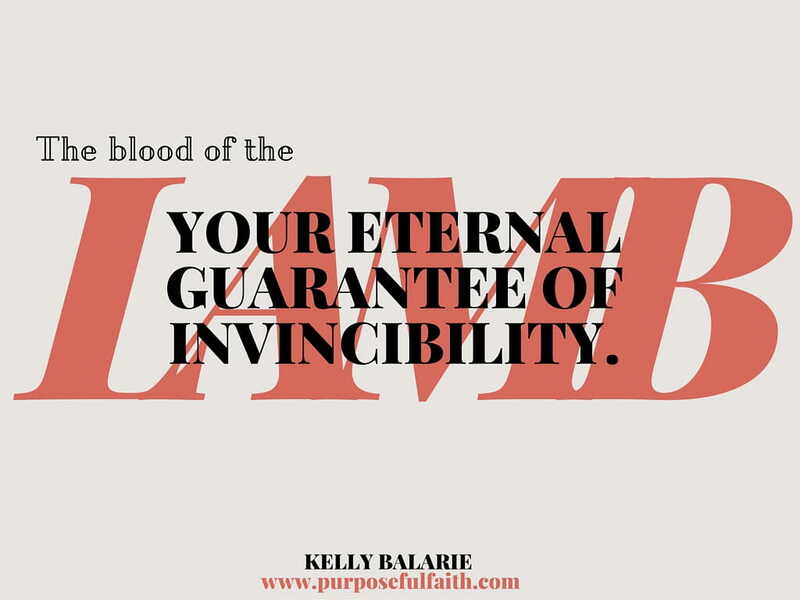 When you are covered by the blood of the lamb, you are covered with an eternal guarantee of invincibility. We have the power of Jesus Christ behind us. We have the authority of his name handed to us. With authority, comes responsibility. We cannot lay down like passive babies waiting for our Father to come feed us our daily bread, sometimes, we have to get up to start screaming God's goodness all over ourselves. shoes that step out, step in and step up to bring the gospel of peace. a shield of faith that makes flaming arrows of the evil one impenetrable. a helmet that keeps a mind steady with the truth, "Once saved, always saved." a sword of the Spirit that cuts out flesh, lies and fear to usher in all truth. We will be striked, but like Jesus, nothing will strike us away from God. We must though, stand up, wearing the outfit that fits us for earthly attacks.